Island bed? What is that? No, it isn’t a bed with palm trees. An island bed is a bed not connected to anything, such as your foundation or property line. It exists as an island, alone in a sea of grass. This blog post will be about how to make a raised one with retaining wall bricks. Why build it up as a raised bed? Well, in additional to looking better, giving you the opportunity to improve the soil, and improving drainage. You also have to bust up less sod, which is my least favorite gardening task, and I’m sure your’s as well. 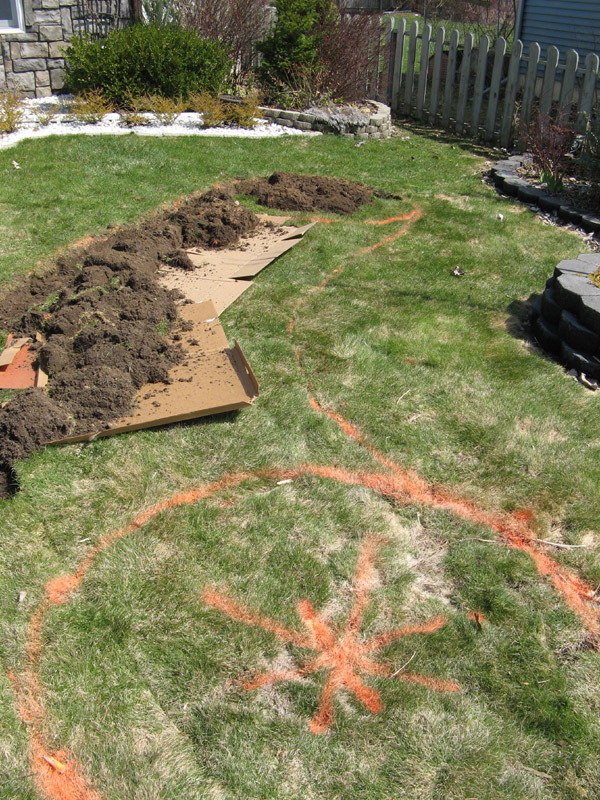 The first thing you need to do is draw an outline for your raised bed. I recommend large sweeping curves, organic shapes. If you want a perfect circle you can do that as well, I recommend cutting a board to the diameter of your circle and using that as a guide. 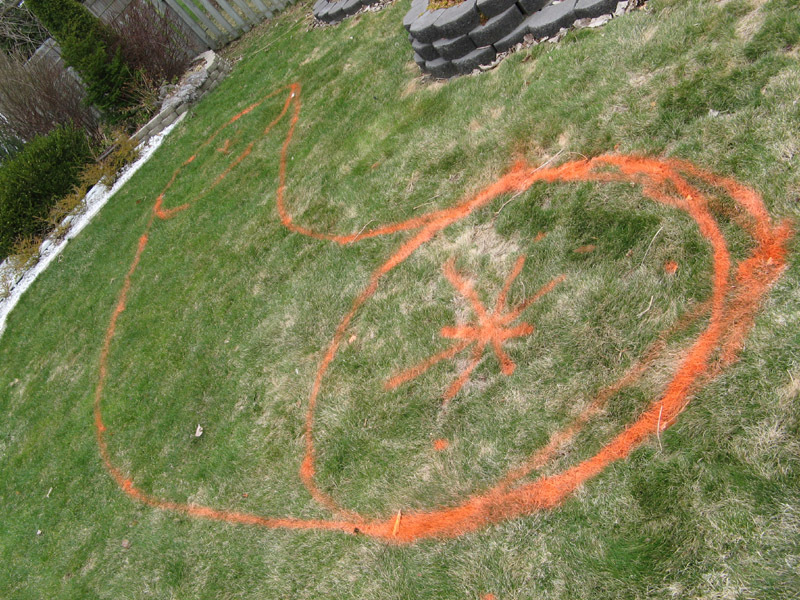 You can use a hose or string or rope to create your shape, but spray paint works best. The next thing will be to gather some plain brown corrugated cardboard or a bunch of black and white newspapers and place it in the middle of your new bed on the grass. This material, which is completely safe for the garden, will act as a temporary weed/grass barrier until it decomposes in about 90 days. You don’t want to use a permanent barrier that will block future roots, you just want something that’ll last long enough to block the grass and whatnot. 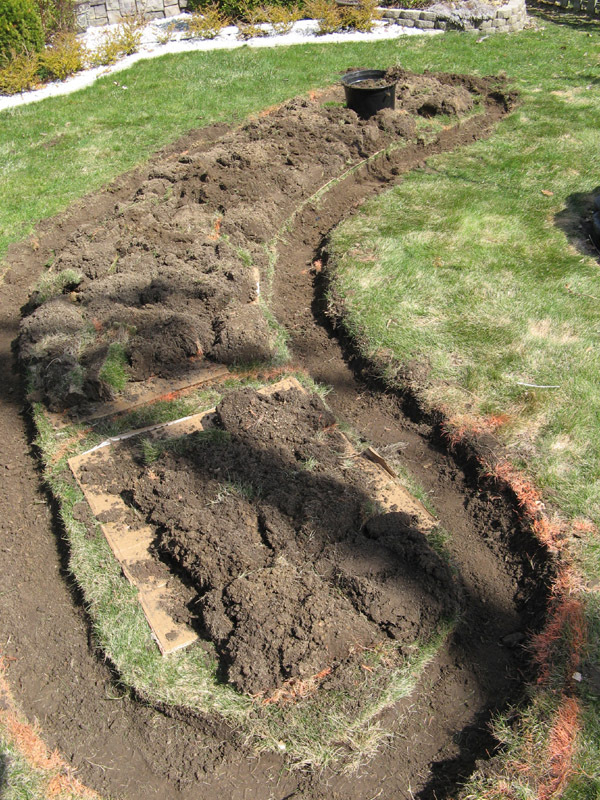 The only bit of sod busting you must do is an approximate 10 inch wide trench along the inside border of your new raised bed. I recommend a flat shovel for this as the bottom needs to be flat and fairly level. If you have a sod cutter/edger you can use it to perforate the area into blocks making it easier to pick up the sod. As you dig, flip the chunks sod side down on top of your cardboard. 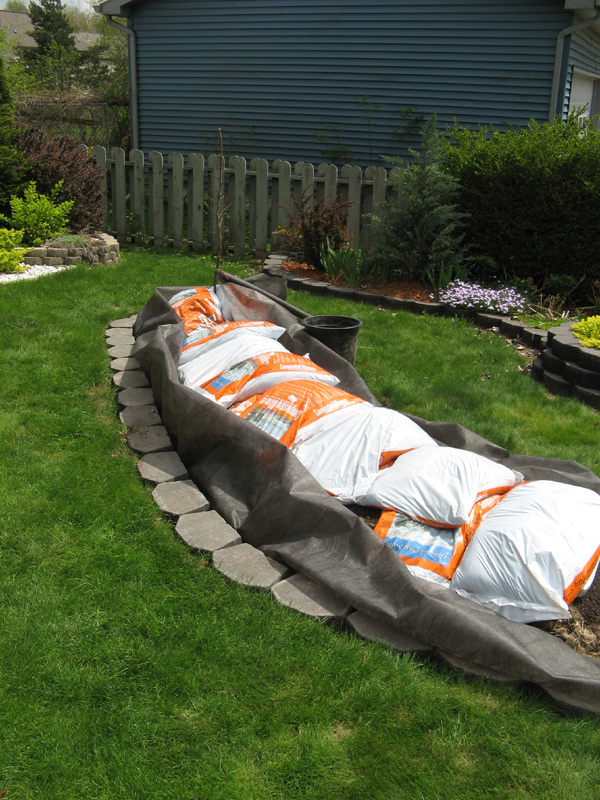 When done, pile bags of composted cow manure (or whatever type of soil you plan on using) inside the bed. I recommend manure because you only get one chance to improve the soil like this. 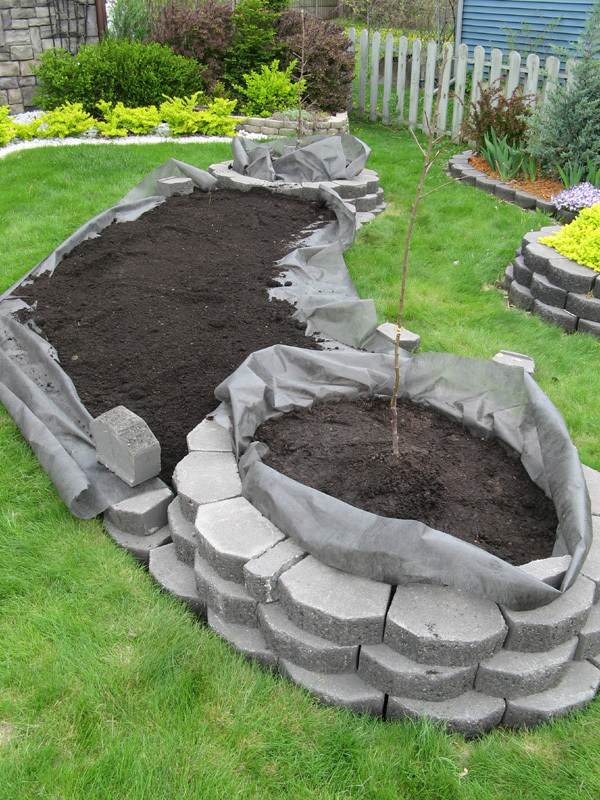 The first thing you need to do here is unroll some high quality weed landscape fabric in your trench with the excess going towards the inside of the bed. This will line your future bricks on the inside to prevent soil from draining out. Then you can lay your first brick in the trench, level it with dirt if needed, and move along with the second brick. This first row will take the longest. Once you get the first row of bricks done, put down a bead of landscape block adhesive and lay the second row (you may need to cut bricks with a chisel or saw to fill in the last one on a row). When you reach your desired height, slash open the bags of dirt inside with a knife and empty them in place. You will probably need to tamp down at the edges. Fold your landscape fabric in towards the center of the bed, trim off any excess beyond a 6 inch swath around the edges of your bricks. 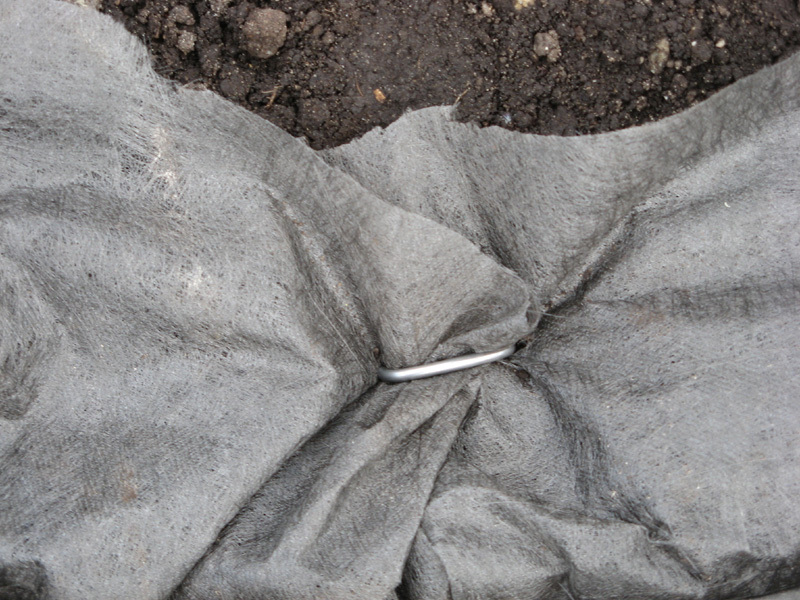 Then secure it to the soil using landscape fabric staples. Your soil is now secure and shouldn’t run out between the cracks in the bricks (too badly anyways). Finally you just need to mulch and plant your new raised retaining wall brick bed. You can do different designs and multiple tiers using the same principles outlined above, you’ll see I did two tiers with the example for this blog post. If there are gaps between the front of your bricks and the lawn you can fill it with any leftover soil, or leave them be and they’ll fill in eventually by themselves. You should expect some settling over time on the bed contents as the grass way underneath rots, so feel free to really mound up that mulch. You may find this video and this article helpful with completing this project. That looks very beautiful 🙂 I did something like that but with rocks. So, you don’t remove the grass under it before proceeding? You just let it die under the cardboard? Love it! Perfect for the small yards we see here in Key West. And the paver choices available today make it easy to be very creative. All I can say is “awwww…” You made it seem so easy so I am more motivated to try your idea out. The final result of your effort was amazing. I would definitely have this blog bookmarked for when my yard is ready for a major renovation to make way for my garden. All the steps that you mentioned are simple, clear, and easy to understand. Thanks! How timely that I just found your blog today and this post in particular! I’m in the planning stages of a very large new flower bed and this is exactly the type of information I need. Thanks! Wow, that is really cool! My parents have wanted some landscaping done for a while and I volunteered to help them come up with ideas. I really want to incorporate a stream, too. This is a nice start! Thanks! This is Awesome! And how wonderful that you did this island bed with retaining brick walls using those 7 easy simple steps to follow? I really like how the finished product looks. Wow, that last picture is not what I expected to see! 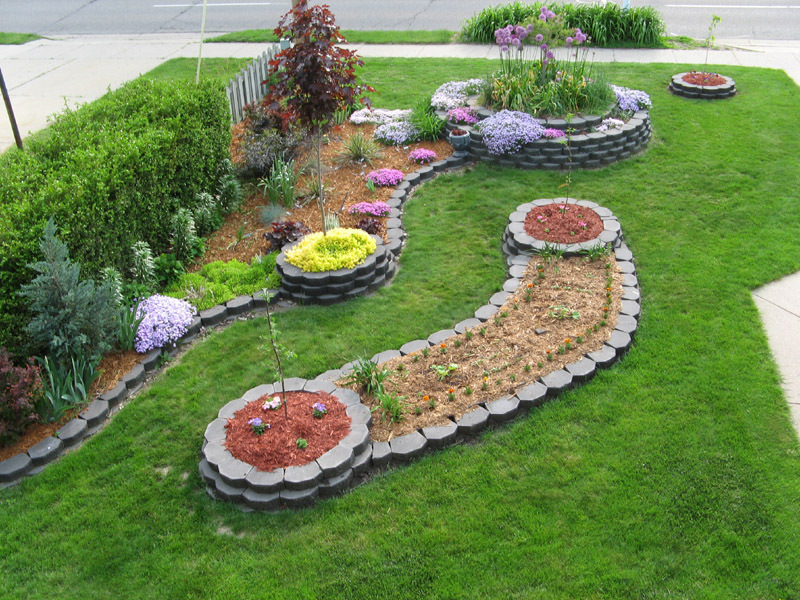 I was thinking on doing something like this in my back yard since the garden just wraps around the property line and looks a bit boring. This is such a great idea. With my husbands help it doesn’t seem to be to hard either! I would just be the one to spray paint over and over again because I keep changing my mind of the shape! Thanks for sharing! When beginning to build your garden bed, I found it useful to use a weed whacker to rid the surface of grass/weeds the future garden bed.This also allows you to visualize what the shape of your bed will be!!! This is absolutely gorgeous !! Your block is very informative and well explained. Very impressed with your information you passed along,as well as what sounded to me was some trial and error experience. Thank you for the tips, I feel I can actually make one of these.